We are living in one of the most transformational times in human history, creating a paradigm shift that will bring change at a speed, scale, and force unlike anything we’ve ever experienced before. This paradigm shift is widely recognised as the Fourth Industrial Revolution (4IR) and has the potential to change everything. What defines the 4IR as distinct from past cycles of industry revolutions is the convergence of the physical, digital, and biological worlds. Each industrial revolution had a profound impact, allowing humanity as a whole to adapt and evolve. The first is commonly defined by physical mechanisation through water and steam – increasing power – where the second saw mass production, assembly lines, and electricity dominate our lives – increasing scalability. Around the 1960’s, and cresting now, is the third, defined by digitisation – increasing information integration. On the horizon, the 4IR wave will be far more transformative through physical, digital, and biological convergence. Unprecedented advancement in technology, the explosion of data, and our ability to consume and convert it into intelligence, is causing our physical and digital worlds to converge at rate like never before. Consider the convergence of medical data and wearable technologies or 3D printing. Genome sequencing and DNA technologies converging with artificial intelligence and 3D printing to someday “print” organs – organ donation could become obsolete. That same foundation of medical data and new knowledge applied to patient information, captured through mobile and IoT enabled wearable devices, used to monitor patient health in real-time, can lead to improvements in healthcare modalities such as personalised cancer, diabetes, and maybe even mental health treatment. There are a myriad of innovation examples possible across every industry that will drive these profound changes. Even current limits of computational capability are being addressed with the advent of quantum computing that is expected to provide the exponential increase is computational power necessary to enable this – science fiction is becoming science fact. In the midst of all this opportunity, 4IR also brings to the forefront some important concerns. Every industry in every country is likely to experience a new cycle of disruption of a breadth and depth never seen before, through the transformation of systems of production, interaction, management, and governance. These advancements also necessitate a level of transparency and information sharing about everything that can pose some ethical concerns that are just now starting to be addressed through regulation. A current topic high on the list is privacy – brought to light by the EUs GDPR regulations. Respecting individual privacy whilst being able to drive these innovations will become an important balancing act as we move forward. For those enterprises not already riding the crest of the current wave, the disruptive impacts of both disruptive new solutions and regulatory challenges aimed to protect citizens, may become foreboding obstacles for many organisations. There are so many domains impacted by this new wave, and new conversations arising across all industries when considering the opportunities 4IR brings – trying to wrap one’s mind around it necessitates a framework to ground our thinking in how best to approach and prepare. To that end, we might consider five pillars, critical areas to be considered as part of a transformation journey into the Fourth Industrial Revolution. Very few organisations have a full understanding of what data they have, what more they can acquire and use, and how it can be harnessed to create measurable value. According to IBM MDI research – Chief Data Officer: Creating Value Through Data – data today represents up to 31% of the company’s revenues, and is expected to grow. It is vital that organisations put this high on their agenda. Management and governance is essential, hence the advent of the Chief Data Officer (CDO) role. The CDO’s role is to clearly articulate a data strategy and culture across the organisation and within the business ecosystem, aligning all under a common vision of how the convergence of data and emerging technologies will help enable new innovation and offerings to customers – whether consumers, patients, or citizens. Essential to this success is the creation of a cognitive journey map, driving a clear innovation strategy to maximise use and value. How is digital dexterity then enabled? One example is the concept of self-sovereign identity. The challenge to be dexterous rests in finding the correct balance in sourcing and using needed data, whilst being trusted and compliant. Today’s typical models are leveraging centralised and decentralised sources of data from a variety of sources, mined without full disclosure and transparency. A key concern of regulators is the enterprise assumption that customers are ceding their ownership of data about themselves (their privacy) through terms of service contracts. As regulatory scrutiny increases and new controls, such as GDPR, come into play (right to be forgotten, right to transfer, right to cancel, etc.) – a more efficient approach will be needed. Self-sovereign identity begins to address this by acknowledging a change in ownership of our personal data – from the domain of the enterprise to the domain of the individual. Then the individual can gain control over “what they can do”, as opposed to the enterprise determining “who they are” and offering things they may or may not want. Imagine air travel with all its current challenges to reduce queues, digitise border control, airline efficiency, and customer experience. Visualise walking through an airport scanner that recognises a traveller’s biometrics, retinal scans, because they exchanged them for loyalty points or an upgrade to business class. Take it one step further, their data packet is connected to their personal or a corporate blockchain, and their luggage has an RFID sensor with immersive security recognition built in. Finally, the traveller has given permission for this convergence of information because of what they want to do – travel with greater ease and benefit. The innovative use case here for self-sovereign identity is ease of travel; no passport, corporation interaction, government border confrontation, whilst better addressing current concerns about individual privacy. With 66% of the jobs forecast for the next ten years not yet invented, this represents a real challenge for organisations to define their workforce talent needs, educators to evolve curricula to meet future demands, and individuals to explore new career opportunities which in turn influence their education journey. This is essential when considering how organisations are constantly evaluating the talent and skills needed from the human workforce in the face of evaluating opportunities for work that can be transitioned to cognitive solutions – for instance cognitive robotic processes enabled by emerging technologies such as artificial intelligence or blockchain. Controversy is created today when questions are focused on the socio-economic, ethical, or personal implications of the potential for machines to replace human in the workforce. Arguably, the conversation needs to change to what evolution is needed to influence how we prepare for this future and ensure widespread employment displacement does not occur leading to unintended adverse economic conditions. Embedding technologies like artificial intelligence and cognition into workplace processes is becoming more prevalent. C-suite executives are realising the value these could bring, especially in areas of process automation, efficiency, data analysis, performance insights, and even new products and services – all integral to any company’s DNA. Traditional human job roles are changing, and emerging technologies are creating new ones at a rapid pace. There is a recognised global “skills gap” emerging, largely in the digital skills space, often referred to as “new collar” and “digital collar” jobs. 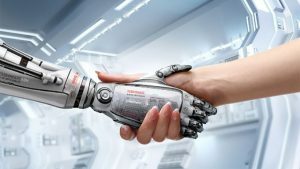 The answers lie in new ways to source talent and the recognition that it’s about “man and machine convergence”, but not the controversial man or machine conversation dominating media today. Artificial intelligence and cognitive automation are inevitable and will become integrated into every day society and cultures as “pervasive artificial intelligence”. We are already seeing examples of this with Dubai Government by announcing the world’s first state minister for AI in October 2017, whose goal it is to make the UAE a leader when it comes to Artificial Intelligence research, development, and innovation to better serve humanity and its citizens. For executives, reshaping and engaging their businesses to cope with the impending employee fluidity will be a key measurable ingredient in organisational success to build brand advocacy (this is a great place to work), in order to attract and retain new and needed talent. This will necessitate rethinking how talent is sourced as well. Some experts are starting to refer to the old term “crowd sourcing”, as the “human cloud”. This necessitates reinventing the traditional organisation model by addressing culture, recognising the value of human insights as uniquely human, adopting new talent sourcing channels, continuing to evolve the employer-employee “contract” and encouraging perpetual learning, if companies are to survive and thrive. At its core, it necessitates the recognition that workforce displacement and continued erosion of the middle class is an unacceptable outcome for this new world – humans are essential. To help with the impending skills shortage 4IR will bring and the changing landscape of the future workforce, governments and the educational system also have a huge responsibility in nurturing the talent of the future. Schools and universities must align themselves with business and industries early in the lifecycle, recognising they have an essential role in both building the foundation for new learning ecosystems and creating new learning paths. By aligning closely with business leaders, enablers, and by monitoring thought leadership trends, educators should be better placed to support future generations with the right skills and help build or contribute to the organisational or human cloud ecosystem. Despite all the technological advances, it is still the human-only characteristics such as emotion, intellect, wisdom, and ethics that set us apart. These values need to be nurtured because everything that can’t be digitised or automated in the future will become valuable commodity. The truth is, people remain the most important asset a company has, so it must ensure they provide a culture in which to excel in the new Cultural Organisation. The Cognitive Enterprise is the rise of a new business paradigm that leverages exponential technologies to use data in a way which gives rise new opportunities and experiences for the world. The first such businesses are well known today – Apple, Google, Über, Airbnb, and many others. A platform is a business model that creates value by facilitating exchanges between two or more interdependent groups, usually consumers and producers, but as we progress, this will expand to become a fully immersive, collaborative ecosystem, all interrelated and supporting the platform economy. In 2009 we witnessed examples of digital disruption appear or Überisation. This was a great example of disintermediation, described as “the removal of intermediaries in economics from a supply chain, or cutting out the middlemen in connection with a transaction or a series of transactions”. Today we are starting to see even more radical industry convergence through re-intermediation, where the disrupted are fighting back to become disruptors, breaking down the process workflow even further in order to take back market share. Consumable Platforms – Cloud – (public, private and hybrid): Build platform business architectures that can scale through shared services, encouraging trust and collaboration to facilitate a sharing economy. Integrate legacy environments with the digital platform technology such as IoT, blockchain, applications, and business process automation, and foster partnerships ecosystems in their value chains. Look to agility and even be open to sharing assets and people skills. Senior executives should encourage rapid prototyping, fail fast and encourage innovation, and ensure you transform quickly for competitive advantage. Create value from reciprocity and adopt a deeply collaborative approach that spans your ecosystem to create win-win propositions and commit to innovation, reallocating capital and resources from defending markets to innovating in new ones. Business Insights – Data: Maximise the cognitive power of your data fabric, from the data lakes of structured and unstructured data, to the data science capabilities of deep learning, data mining and predictive, prescriptive, and cognitive analytics. Harness your systems of record (SoR), systems of engagement (SoE), and systems of insights (SoI) through real-time dash boards and self-service reporting for measurable value. Cognition/AI: Capitalise, cultivate, and orchestrate data assets to hone performance and the capacity for continuous change. Build the cognitive platform, encompassing self-learning systems, natural language processing, robotic process automation, enhanced data intelligence, augmented reality, and predictive patterns – all accessible through an open API economy (application program interface). These elements should be supported by cognitive journey map, cognitive enabled workflow, business process automation, empowering the business to make faster, more informed decisions. Immersive Security: Recent forecasts predict that two-thirds of crime in the next ten years will be cybercrime, which raises the question: what will our law enforcement look like, will they need to be data scientists and will Tom Cruise’s film, Minority Report, about predictive crime become a reality? A clear reality is that as the world becomes more reliant interchangeable data, it will be vitally important to consider a security approach from a data centric model. Understanding our data, where it is, and its taxonomy is a prerequisite to enable us to understand how to apply security controls and related technology. To succeed in the new world, executives need to ensure with have the governance and policies in place to combat change. In short embed trust and security into everything. In the fourth industrial revolution, the IT landscape will look fundamentally different to the one we see today, and won’t be a collection of systems but an array of interconnected eco-systems based on platform business models. Future reallocation could approach an estimated $1.2 trillion in the next few years, up $730 billion, an increase of 72%. This is what experts refer to as “making the platform play” and requires a strong belief in their own market position, core capabilities, technologies, and business models. If they get it right, it will not only provide ways for organisations to capitalise on their own transformational strategies, but encourage their ecosystems, partners, or even competitors to leverage their platforms. This opens the door for entirely new business model platforms at industry, country, or government level, supporting economic platforms, smarted cities, and improving GDP. These disruptive behaviours are forcing organisations to reassess the attributes of effective platform business model strategies and the execution required for monetising them. A growing number of organisations are embracing radically new models and instead of going it alone, they’re innovating with partners. These new partnerships are building shared platform ecosystems – harnessing and creating large scalable networks of users and resources – that can be accessed on demand through data sharing. This is referred to as: coopetition. If cognitive enterprise platforms represent the technological foundation for the successful transformation into the fourth industrial revolution, then collaborative ecosystems represent the ability to monetise and scale. Successful organisations will need to engage with multiple ecosystem of platforms to support their business. The competitive advantage will depend on how well and how fast a core platform is able to learn exponentially and continually adapt to the shifting marketplace. Equally important and vital to data monetisation are the transactional ecosystems, supported by game changing “smart” technology platforms like AI, weather, mobility, blockchain, IoT, and eventually quantum. These platforms will help facilitate radical decentralisation, creating new business models, business redesigns, integrate supply chains, and provide platform innovation that can be both transformative and disruptive. Many large organisations are radically digitising the world’s trade through the supply chain. The result is an integrated ecosystem platform that provides more efficient and secure methods for conducting global trade using blockchain technology. For example, we are seeing evidence of first of a kind blockchain solutions to transform the diamond marketplace, to ultimately reduce fraud and black market trade. The technology is used to track the provenance of the diamond, thus providing an immutable, distributed ledger audit trail for the traded stones by digitizing the current paper based diamond certification system, the Kimberly Process. Food organisations are improving traceability and transparency of the food supply chain using blockchains and IoT, to build the ultimate digitized food system that can be tracked within minutes from an ecosystem of suppliers to retailers and ultimately to consumers. Banks are establishing a digital identity verification network that shares identity attributes and will reduce costs for banks and improve customer experience. Future business models build trust as they interact with the correct individual helping to enable Self-Sovereign identity, leveraging a blockchain network, to access a range of services across organizations and share only the minimum required identity attributes. A different perspective of new collaborative ecosystems that leverage the sharing economy is DreamLab (vodafone.com.au/foundation/dreamlab). This represents an attempt at helping solve societal problems such as cancer, by encouraging communities to download an application that uses the processing power of your idle phone while your sleep. The more people that use the app, the faster it works, and the faster we can help develop more personalised treatments. This innovative application was created by the Garvan Institute of Medical Research, and Vodafone Foundation Australia, which funds health and well-being projects that use mobile technology. When a phone with the DreamLab app installed is fully charged and plugged in, the app will automatically download data and analyse it using an algorithm, before uploading it back to the researchers via the cloud. The app uses “distributed computing” to harness the combined power of thousands of small computers, effectively turning them into a supercomputer. What both these examples represent is the ability to leverage the platform ecosystems, connecting the dots for mutual value, and proving innovation from different ends of collaborative spectrum. 5. Customer value – “Data driven insights leveraging real-time interaction, augmented intelligence, and immersive innovation, delivering measurable valued experiences”. Customer value represents shift from the simplistic digital models characterised in the third industrial revolution, to much more complex innovations based on products and services being enhanced by data and with an openness to collaborate. We are moving forward from a path to personalisation to an experience that is all about individualisation. No one size will fit all and 4IR will help tailor an experience to meet the lifestyle of one. As corporations compete for our time and, more importantly, our cash, they need to understanding consumers at a micro level, using cognitive real-time analytics, artificial and augmented intelligence, and deep learning. These elements will have a profound effect, helping understand our lifestyle behaviours, preferences, and buying patterns, recognised as ‘the attention economy’. Transformative business models that support brand advocacy will also play and essential role in the support of a contiguous customer’s journey, with consumers, citizens, and employees playing a far more interactive role through perpetual real-time feedback. One of the profiles that embodies customer value – and looks at who will shape and live these new paradigms of experience – is Generation Z or GenZ. This group will engage whenever and wherever they want. So be responsive by experimenting and reconfiguring capabilities to meet their needs. Leverage voice and facial recognition and AR and VR to knit together digitally integrated experiences. They embrace robotics and cognitive/AI to remove friction, offer autonomous services, fix issues, and implement speedy resolutions. Enable your physical spaces to be more intelligent, using sensory devices to collect and learn from data about shoppers, and broaden the mobile and digital experiences to add convenience, education, and games to keep them coming back. But it’s not just restricted to the consumer end of the scale, corporations and governments also need to embed all of the above and include traits like provenance, ethics, sustainability, and corporate responsibility into everything they do, understanding their influence, ultimately measuring the experiences they provide. In order to make the transitional journey from the later stages of the third to the fourth industrial revolution, corporations should look to embrace and leverage many of the key characteristics of digital dexterity, cultural organisation, cognitive enterprise, and collaborative ecosystems to deliver actionable insights that support customer value. In order to thrive, they should harness these combinatorial elements and infuse them into every aspect of business decisions and processes to drive efficiency and agility, ensuring they measure success and maturity in this new data-led and on-demand” economy. The world is changing at an exponential rate where data, AI and immersive security, if not already, will become part of our everyday DNA fabric, embedded into everything we do. Everything that can be connected, will be connected and the fusion between the physical, digital, biological, and neural networks have an air of inevitability. For humans to succeed in this ever changing world, we all must embrace the change and transcend the technology, not let it overpower us, harnessing its transformative power for greater good and to improve our world. 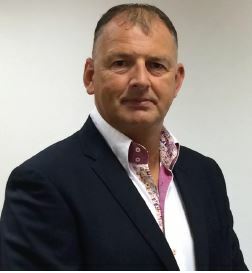 Ian Fletcher was educated in the UK, graduating from Birmingham University, and built a successful career in IBM Global Technology Services and Global Markets. With over thirty years’ experience in technology and business consulting services, Mr Fletcher leads the IBM IBV C-Suite study for the Gulf & Levant Region. Mr Fletcher also runs IBM’s thought leadership programme locally, advising clients on business transformation and strategy. More recently, Mr Fletcher has competed his substantial research on the impact of the Fourth Industrial Revolution and, in turn, its impact on the C-Suite. The right partner for a changing world. IBM is a leading cloud platform and AI solutions company. Today, it is the largest technology and consulting employer in the world, with more than 380,000 employees serving clients in 170 countries. The IBM Institute for Business Value, part of IBM Services, develops fact-based strategic insights for senior business executives around critical public and private sector issues.